I have been reproved by 2 writers for sarcasm and a “sniping attitude”. I believe in both cases the critics are far more concerned with my “attitude” than the content of what I am writing. Both the Lord and Paul demonstrated impatience and/or used sarcasm with those who dealt loosely with Scripture, and that is what Scott has done in his posts. The reason for my “attitude” relates to the tenor of many of the posts in response to Brandenburg’s writing on this subject. I cannot speak for Brandenburg and do not know how his story will turn out. However, I would guess that the types of input posted here demonstrate a primary reason for “leaving fundamentalism”. I hope that you will carefully consider what I write here. Probably most who have written here are from “independent Baptist” or “fundamental” churches. At the very heart of such religion is the concept of having “regenerate churches”. It is not just having orthodox doctrine, but having churches made of people who are genuinely saved. However, many of you have written in criticism of Bethel Baptist Church’s actions (BBC), not understanding that your view and understanding of this issue is what is destroying and discrediting the claim of “fundamental” churches to be Biblical or NT churches. Let me explain. The whole idea of a NT church depends upon the guarding of the integrity of its membership. If we are not careful in preaching the Gospel, examining the profession of those we baptize, and checking up on the proven testimony of those we receive from other churches – the effect of our practice is to fill our churches with unregenerate people. You may not like the fact that a pastor would question your testimony when you want to join the church he oversees, and you may even be offended that he would call your former pastor and question him about your testimony, but it is his foremost duty if he is going to present his church as “a chaste virgin” to the Lord in the day of judgment (2 Cor. 11:2). Likewise, when a pastor overlooks sin in his congregation – including unresolved personal disagreements (Matthew 18:15-20), immorality (I Cor. 5), divisive teaching or actions (Titus 3:8-11), and, yes, even whether a man will or will not work to support his family (2 Thess. 3:6-15) – that pastor is guaranteeing that sin will multiply in his church. A profession is just a profession. When a profession proves to be untrue by a disobedient life and the pastor and church will not remove the person who continues in sin, the church will lose the integrity of a regenerate membership. In many “independent Baptist” and “fundamental” churches their claim to “NT Christianity” is gradually becoming hollow. They eagerly accept members from other churches without ever contacting that former church and pastor. Oh, they might send a little piece of paper like the Southern Baptist Convention churches do requesting “a letter” as a formality, but they do not want any real information about the person’s life or testimony. The “transferring member” could be an adulterer, liar, heretic, etc., but the church who received the new member does not care. In fact, as has been demonstrated by many posts to Brandenburg’s article, the church will not only receive the member without checking but will condemn a sister church for any disciplinary steps it has taken. This is not love. What it is is the road to apostasy. Why do you think that most independent Baptist churches have an attendance record as follows: 200 Sunday morning, 100 Sunday night, and 50 on Wednesday prayer meeting (if they actually pray in prayer meeting)? Why, when that same church has visitation to evangelize the lost, will only 25 people show up? The pastor of a “good”, large, independent Baptist church and a very well-known, independent, fundamental, Baptist evangelist both told me without any hesitation that in most such churches only 15 per cent of the congregations do any real work for the Lord. It was their evaluation that probably only about 15 per cent of the memberships were saved. This is NT Christianity? What Brandenburg has written about here is not a matter of a church being too strict or trying to tell another church what to do, it is about the very heart of NT Christianity: seeking to have a regenerate church. The action by BBC to contact the other church has to do with 3 things: 1) The desire to please the Lord by obeying His commands; 2) The desire to help a man and his family who have serious sin problems; and 3) The desire to prevent another church from receiving a potentially unregenerate man into their congregation. The responses Brandenburg has received by people who found every kind of problem with the action of BBC demonstrate that most of them must not understand what a NT church is supposed to be. I am not “hurt” by Scott Leigh’s or “anonymous’” criticism of my tone. I do not claim to have any super spirituality, but it would be unrighteous to respond to posts like Scott’s without anger about his cavalier approach to Scripture. Anvil and others have asked me questions that indicate their probable disagreement, but my responses were different to them. Perhaps many of you did not grasp the serious implications of the actions taken by BBC, but hopefully you will take time to think about it and about whether or not your church is guarding the integrity of its membership. You may disagree with many of his positions, but when you criticize him and his church for the actions they took in this case, you are demonstrating a failure to understanding and to guard the integrity of a church as defined in the NT. Two of my daughters, Julia (11th grade) and Natalie (8th grade), played violin with Young People's Symphony Orchestra at Davies Symphony Hall on January 18, 2011. Here is an excerpt from Jean Sibelius' Symphony No. 1, 4th movement, conducted by their music director, David Ramadanoff. Beginning at about 52 seconds, you will see Julia on the far right in the frame and Natalie with glasses right in the middle, parallel with Julia. Fundamentalism is a movement. For what is good about fundamentalism, you don't need fundamentalism. If unity is between all believers, you aren't getting that by being a fundamentalist. If unity is in the church, you don't need fundamentalism for that. You need only your church. On the other hand, choosing not to be a fundamentalist doesn't move you into some other group other than the church. For instance, not identifying with fundamentalism doesn't mean you're now in the movement called evangelicalism or one called new-evangelicalism. Those are both movements too, by the way. Evangelicalism is a nice word, just like fundamentalism is, but they're both movements. You are not either a fundamentalist or an evangelical, which is a false dichotomy or bifurcation fallacy. This kind of binary thinking, unfortunately, is typical of fundamentalism. When you stand before God, He's not going to have expected you to have been in any group or movement not mentioned in Scripture. The Bible is sufficient and it doesn't go beyond the church. Rest easy. Be content. These movements, these small ponds, were not started by and are not headed by Christ, so the gates of Hell can and probably will prevail against them. My opinion is that they are potential little towers of Babel that can't reach up to God. God used fundamentalism in my life, but I left fundamentalism. I continue my story. Our church disciplined a man out of our assembly. One year before, the mission director of BWM had thanked me for not recommending him as a missionary. The man refused a mentoring program with me that the mission director required (this is all on paper) for acceptance by BWM. The man was accepted by a fundamentalist church in San Francisco after we had disciplined him out of ours, whose pastor was on the board of BWM. Within a year, his new church recommended him for acceptance by BWM, which accepted him as a missionary. I called the director of BWM. I had read both his books on holiness and separation, and even though I had issues with some of their exegesis, I ate them up. In my naivete, I believed in the man. I knew he would do what was right. I knew it. I had that kind of confidence in other people like him. Someone who wrote those books would do the right thing. He didn't. Someone might say, "Welcome to the real world, Kent." Thank you for that, but I may have missed the welcome packet on the way in. We've got to get someone manning that front desk. So I called this man I had great respect for and he talked like we had never talked before, like this was a situation he was not familiar with. I reminded him of our other communication of what he wrote to me, of what he required of the man only a year ago, that had not been fulfilled and worse. He played it dumb. He told me that it was a matter between two local churches, that I would need to settle that between the other church (which, of course, I planned on doing, but I was talking to this missions director first). I told him that "no," it wasn't just between two churches, but it was a matter between our church and BWM too. We had disciplined this man out of our church and BWM had accepted him in. I had read his books. I reminded him that I read his books, and I had underlined portions in preparation for that phone call. He himself had written that "agencies," like his, were to be treated like a church in matters of separation, according to him. Those were his own rules. He said something like, "Well, we're going to have to just agree to disagree, and you're going to have to take it up with that other church; it's out of my hands." I saw him as cutting his losses, i.e., choosing what hill he would die on (and other such nonsense I had heard in fundamentalism). I told him that nothing had changed since a year ago since he had thanked me for not recommending the man, except the man was worse, to which he was silent, except that he said that the man sent a very good doctrinal statement. I replied that someone could copy the language for the statement from other men, people did it all the time. He said, "Uh-huh, but it was good." There we go. Wow. Man-oh-man. Head wagging. I guess I should have expected it. Are things really this bad? I thought the words in his book meant something. Here's what I found that they meant. They meant that whoever had the most juice, the most political juice, the one who could do the most "damage," he's the one you listened to. I didn't have that juice, so I was not going to have "my way." But what about God's way? Here's what had happened. We removed the leaven from our lump (1 Cor 5). BWM took in the leaven from our lump. We could have no more relations with BWM without the leaven again leavening our lump. We were supporting five other BWM missionaries, mainly because of things like I had read in their director's books. We would not remove the leaven from our lump only to have it leaven us again. I'll come back to that part of the story later. I've got no axe to grind here. I'm happier than ever. I'm giddy to have all of this in the rear-view mirror. Leaving fundamentalism gave me an oxygen mask I didn't know existed. I didn't call the big-wig pastor. Our church voted to treat their church in the manner we treated our disciplined member. We used Matthew 18:15-17 as a model for how to deal with the other church. Our goal was to reconcile. I held out hopes that church would want to reconcile. That would be the right thing to do, to settle it with our church. Our church met and agreed that, to be gracious, we would offer three different dates for the men of that church to get together with the men of our church in order to reconcile this situation of their having taken our disciplined member. We were trying to stay in fellowship with that church. The normal way in fundamentalism, and even the way I had been instructed, was just to let it go. "Letting it go" meant one of two things. One, it meant that your relations to that church didn't change at all. You just acted like nothing happened. Did something happen? Yes. God knew something happened. But we would act like it didn't. We would go all thespian. Two, it meant that you just ignored that church forever, disfellowshipped from the church, but just never told the other church. They would get it after a period of time. This is the cold shoulder that fundamentalism is so famous for. And would they even notice the cold shoulder? Probably not, because the movement and the "fellowships" were really not about fellowship after all, but about the organization, the little tower they were building. A church isn't really big enough. You've got to have a conference at which to preach to others to improve your own status, at least in your own mind. So the men of our church signed the letter with the three dates and sent it registered mail to the church who had taken our member. This pastor, by the way, was big in the FBF in California. Meetings were held at his church. Just a few years before this, I went to the ordination of one of his sons, to be a pastor. During the ordination, a pastor on the ordination council asked him if he owned a Strong's Concordance. The boy stood there like a deer in the headlights, an overused analogy, but very apropos in this context. He shrugged. He did not know what a Strong's Concordance was. We were forced to sit there without laughing. I squirmed and tried to look around to see if I might get eye contact with someone else, but decided I shouldn't for fear that some kind of negative momentum would shift us from the facade with which we were working. The young man was a fundamentalist Bible college graduate, actually from my alma mater, and we were questioning on the council. His non answer to that question meant that we would be throwing the softest softballs, whiffle balls, for the rest of the council. He would be "ordained" because he had been "called," but mainly because we wouldn't dare not ordain him because of who his dad was. I remember feeling grimy that day, watching those proceedings. Fundamentalism had programmed us to stay silent in the face of such incompetence. I would say "I digress," but I really don't. It really wasn't the boy's fault. He shouldn't have been up there that day. I think you know that. So what happened? A short while later I got a letter back. It was 6 pages, single-spaced, small print, small margins. First, the letter was six pages of name calling. The man called me every possible bad thing without moving into actual filthy language. It was worse than filth. Second, he said, "how dare we give them dates to reconcile"---they didn't need to reconcile, they didn't do anything wrong. There were no arguments from scripture. There were no challenges to what we had said about the man we disciplined. The letter was only about 5 1/2 pages of slander about me, calling me nasty names and saying nasty, untrue things. He sent a courtesy copy to the director of BWM. It wasn't gossip. It was a "courtesy," something offices do, you know, CC, courtesy copy. That's all it was. At the end, he said that if we did anything, anything, he would send a copy of that letter to men all over the country. He was threatening me, to force me to do nothing in this situation. If you are trying to remember a passage that instructs someone to do this kind of thing, you can stop now---it's not in the Bible. By the way, I said 5 1/2 pages. It may be 5 3/4. There was one little part of it, about a quarter of a page, that I found was true. However, I did not know about that little part until then. Yet, it is part of this story, my story about when I left fundamentalism. A big part actually. But I'll get to it later. One part he got right, but I hadn't heard that this thing had even happened. That was a really good part about getting the letter. Something had happened that I didn't know had happened. His letter made it an easy decision for our church. We voted not to have fellowship with this church without future repentance. And yet, I would be seeing this man in the leadership of FBF meetings I would be attending. Hmmm. Do you think I should go for the "fellowship?" Or do you think it might be bad to the meaning of "fellowship" to call that fellowship? One of the next things I did was to write a letter to all the men who attended the Northern California FBF and tell them that I could not remain in fellowship with the fellowship with a man there with whom I wasn't in fellowship. I didn't give the gory details, just the scriptural bullet points to tell them why I would be attending any more, so they would know. We were all in fellowship, after all. They should know. I sent about 30-40 of these letters. Of course, I was risking the widespread distribution of the slanderous letter, but my conscience was clear. I suggest you review the "letting it go" section of an above paragraph to understand how fundamentalists were indoctrinated to view such a thing as I was doing. They were likely puzzled why I wasn't "letting it go." I thought that I shouldn't call something fellowship that was not fellowship---it sort of messed up the word. I wanted to keep fellowship and the biblical concept of fellowship intact. I got two responses to my letter. Two. They were both very, very short. One was a phone call from a young man who had been pastoring for a year or two. He asked if I was talking about him. I assured him I was not talking about him. Once, he found that out, well, he thought he could let it go. The other was a letter of about three sentences from a man who acknowledged he had received the letter and that, although he felt sorry for me, he disagreed. He didn't say why he disagreed or what it was he disagreed with, but he registered that he disagreed. I found that the fellowship was such that people didn't care what had occurred, nor would you be missed. So that's also what I would be missing by not being in the FBF. Nothing. I would miss nothing. Actually, I would be blessed to be missing it. Since then, I have missed the FBF in a very good kind of way. My only personal desire to return to one meeting in the future would be for the purpose of looking these men right in the eye. Since then, by the way, I have heard that it wasn't that men didn't talk about the letter. The letter was talked about. Men knew that I wrote the letter and talked about it. Not with me. But they did talk about it. Is this what we instruct the people of our churches to do in fundamentalism? Talk with others about someone's problem, but not to the person himself. Even recently, I ran into a Spanish FBF pastor in the area, who told me that he had been told that our church was Ruckmanite, Hyles, and 1-2-3 pray with me. That's what he had been thinking of our church for years, because of what others had said. He was surprised to find that I preached from the original languages, had long and publically rejected Hyles, and was the furthest thing away from 1-2-3 pray with me. What would he do now that he knew what he heard about us was a lie? What do you think? Of course. Let it go. I received the communications from BWM through their normal newsletter. I saw that the missions director was going to be in the Bay Area. I thought, "Great!" I could talk to him in person. I wanted to do that. It would be better. I wrote him to tell him I'd like to talk to him. He never wrote me back. I called BWM to ask if I could get together with him, and he never got back to me. I then called the church where he was speaking, and he said that he did not want to talk with me in person. So that's how that ended. By the way, in that conversation, I asked him about receiving a slanderous letter about me. And he said that he had received the CC and put it in his file. His file. I said it was slanderous. He said he was simply filing it because it was sent to him as a courtesy. I would have to take up the matter with the pastor who sent it, it wasn't his problem. I said, you should throw it away---it wasn't true. It is listening to gossip. You should confront the one from whom you received it about gossip, about false accusations. No, he would keep it. It was a courtesy letter. That was his reason. And we were done. Next, I wrote out everything that had happened in the form of a case study. It had no names. Everything was mission board A, person B, mission director C---that kind of thing. I wanted our BWM missionaries to judge what had happened strictly based upon what had happened with no names and no politics. At the end, I asked them what I should do. I got zero responses back from that case study. None of those missionaries sent anything back to me. However, the BWM director got much communication from the missionaries. They asked him what to think about the case study. They sent the case study to him to find out how to react to it. That's when I found out that often board missionaries are really sent by their board, much more than their sending church. The board exerts tremendous power and control, very much like a convention or association. Missionaries very often checked back with the board to know what to do. The boards, I found, bound people and churches together very much like a denomination. I knew fundamentalism was against conventions and associations like the Southern Baptists and the American Baptists, but that mission boards in fundamentalism (and colleges and universities) are the conventions in fundamentalism. Fundamentalism is not without its conventions. It has them in their boards and colleges and universities. In principle, there was little different. The problems of board missions, really an extra-scriptural and even unscriptural concept or practice, became very apparent to me at that time. What Would We Do with BWM? When someone speaks of fundamentalism today, he really doesn't speak of some kind of monolithic, single, coherent group. However, I often wonder why it matters if fundamentalism is "fragmented." Are we to expect unity among fundamentalists? And if fundamentalism is fragmented, what is causing it? Doctrinal differences? Politics? There shouldn't be disunity where there shouldn't be disunity, but what value is there in keeping "unity" that revolves around politics? And is it unity if there are doctrinal differences? Is that a cohesiveness worth preserving? Some are concerned about the future of the fundamentalist movement? Why should it matter if the movement continues? Could we all be better off if the movement sunk into oblivion? One common criticism from certain fundamentalists and evangelicals has been the tyrannical nature of fundamentalist leadership. Is meanness a quality unique in Christianity to fundamentalism? Not at all. Evangelicals are just as "mean," in my opinion. Their sarcasm and mockery of fundamentalism is just as harsh as anything you'll see coming from fundamentalists. I give you a recent example that is really just what I've noticed as par for the course. It comes in a recent discussion online about "Christ in the Old Testament." Mark Snoeberger is a professor at Detroit Baptist Theological Seminary and wrote some of his observations for a future Old Testament class he's teaching at the seminary. I think he made some rightful criticism of reading too much Christology into the Old Testament. Christ isn't more greatly honored by seeing Him where He isn't. Snoeberger said some things in a less artful or sensitive way than some thought necessary, but later he apologized publically for that. Snoeberger's inelegant use of the expression "Gospel Carnival" reflects his contempt for what he calls "the Gospel Togetherness Movement." He says it is not meant to denigrate the gospel per se. However, I think his view does denigrate the gospel, deliberately downplaying what both Christ himself and the Apostle Paul said should be central. Snoeberger had already apologized for his expression "Gospel Carnival." Phil Johnson ironically does not give Snoeberger "due process." I say "ironically" because Johnson himself has written that lack of due process is what will kill fundamentalism, as it stands, if it hasn't already. What I've noticed is that Johnson likes due process for himself and his friends, but he's very glad not to give it those he criticizes. This is just an example of how evangelicals aren't really different as a whole from fundamentalists in what they think makes them different than fundamentalists. We get no mention of Snoeberger's apology or of how Snoeberger had clarified some of the statements he had made. If someone were treating John MacArthur like Johnson treated Snoeberger, Johnson would see that as fundamentalist styled treatment. You haven't escaped meanness if you leave fundamentalism for evangelicalism. I've never seen any Christians as mean as evangelicals. The comments I get at this blog from evangelicals are the most vile and rude that I get, on par at least with Peter Ruckman, if not worse. But I digress. I haven't yet talked about the most pivotal event toward my leaving fundamentalism. I can't tell the whole story in one post, but I'll get started here. Our church had become woven into fundamentalism. We attended fundamentalist meetings, camps, and colleges. Our school joined the American Association of Christian Schools and the California edition of it. We began attending the teacher's conventions for the AACS. We supported missionaries from fundamentalist mission boards. Was this the best thing for our church? I found it wasn't. Affiliating with all these organizations was doing more to hurt our church. They siphoned off a lot of money from our annual budget without helping our church. The preachers that came in to the various "service organizations" of fundamentalism couldn't represent the best preaching. Rarely to never did you hear good exposition. Perhaps this has improved in fundamentalism, but still not at that time. We heard the same people all the time, the big guys from Bob Jones University or from the Fundamental Baptist Fellowship. We paid dues to be a part of the Golden State Association of Christian Schools. We paid for the teacher's convention and for the transportation and hotel costs. I was excited to see what kind of help we could get there for our teachers. I sat in on a session on 'teaching Bible' offered by the president of the AACS. In the session, he said that Bible class needed to be easy. Why? Kids like easy classes, so if you make Bible easy, then your kids will like Bible class. Ingenious, huh? So he taught us how they had made Bible class an easy class, so their kids would like the Bible. If you made Bible class too hard, your kids wouldn't like it, and they would be turned off to the Bible. How does that sound to you? Hopefully very bad. It was in the lobby of that convention that I stood with some of the big names in fundamentalism and heard them talk about how men came to fisticuffs with one another. One of the biggest names in fundamentalism had the other big name by his shirt, and the other with his hands around the throat. The one telling the story told how that he had to break the fight up before it got really ugly. This was a different picture than what I had in mind for these types of men when I was in school or growing up. We had a Filipino man in our church who wanted to go back to the Philippines as a missionary. The man wasn't even qualified to be a deacon in a church, let alone our sending him as an evangelist to a foreign country. Nevertheless, he asked me and another man in our church to send a letter of recommendation to Baptist World Mission. The letter I sent did not recommend him. He didn't have a job. His wife worked, brought home the paycheck, and the man home-schooled his children. He never got to church on time. The whole family was almost always fifteen minutes late. I didn't even know that the other man in our church had sent a letter, which said the same things that I said in mine. I got a letter back from the executive director of the mission board and he thanked me for the letter. He said he would recommend the man to get into a mentoring or internship type of situation with me. The executive direction of BWM was very happy that we did not recommend such a man. The Filipino man agreed to do an internship with me. I wanted to help him all I could. I started with getting to church on time. I laid out an entire schedule for him for Saturday night and Sunday morning that would enable him to arrive early and be a help. Upon seeing the schedule, he decided that he did not want this mentoring and so he would not pursue being a missionary any more. Shortly thereafter, I was preaching a series on Wednesday night through 2 Thessalonians and got to chapter 3. I was convicted about this man not working, being supported by his wife. When I was preaching 3:6-15, I knew that it was speaking directly to him and then to me. I was allowing him to disobey God without correction or discipline. In other words, I wasn't loving the man by allowing him to get away with this, and in so doing, harming our church. I talked to him one-on-one and told him that I would help him obey the passage. Even though I would rather not, we would hire him to work in the school, and he could put his kids in the school for free. That would give him a job and take away the excuse of his children's education. He refused. He said "no." Myself and another man in our church went to him again and said that he needed to look for a job or to accept our job offer or we would bring it before the church. He told me it was too late, because he was going to leave the church. He did. He left and took his family to a church in San Francisco, one pastored by a big-named fundamentalist, a man who was a leader in the FBF and on the board of BWM. When he got to that church, he told the pastor there that he wanted to go to the Philippines as a missionary. That church recommended him to Baptist World Mission. The executive director of Baptist World Mission, who had thanked me only a year before, accepted the recommendation. Our church was supporting five Baptist World Mission missionaries. We had removed this leaven from our lump and BWM had accepted the leaven from our lump---knowingly, with full knowledge. Even at this point, I was shocked at the kind of thing that happened in fundamentalism. The executive director of BWM had written two books on separation and the holiness of God. I had read them both. With that in mind, I knew that when I called him, he would certainly do what was right. I knew he would. So I called. The following notes deal with two books on the subject of wine and the Bible that I have read relatively recently. Dr. Teachout’s book, which I have received permission to post on my website, and is consequently is available on my website--click here, is an excellent resource. The other book is less valuable, but probably has been read by more people, so I have reviewed it as well. Scripture teaches total abstinence from alcoholic beverages, and the resources below help to defend this fact that is increasingly attacked today. The Use of “Wine” In the Old Testament, Robert P. Teachout. Th. D. Thesis, Dallas Theological Seminary, May 1979. Ann Arbor, MI: University Microfilms International, 1980. 462 pgs. Read 2/12/10. Elec. Acc. Dr. Teachout is a fundamental Baptist (although he is critical text, and not committed to literal, word-for-word translation; see pg. 259) who taught at the San Francisco Baptist Seminary run by Hamilton Square Baptist church. He does an excellent job defending the two-wine position that Biblically requires total abstinence from alcohol from the Old Testament, and in several appendices he deals with the NT evidence in somewhat less detail, but still with valuable information (such as clear instances in papyri for oinos as unfermented juice). His bibliography also has valuable information (such as the reference to a Ph. D. dissertation at Columbia University from 1927 by Raymond Irving Woodworth on “The Teaching of the Early Church on the Use of Wine and Strong Drink.”) Overall, this book is the best work on the OT evidence for total abstinence that I have read, and his material on the NT evidence is also very good. 110: Prob. etymological origine of yayin as “to squeeze out.” See pg. 127 for conclusion. 116ff. Potential support for Ugaritic cognate of yayin meaning “grape juice.” Up to 124. 154: A useful chart with all the evidence on it. 175: The Hebrew sba refers to excess in the nature of the beverage consumed as much as to the amount; consider with Ephesians 5:18. 179ff. : Tirosh—always fresh juice (w/ further info. )—typically the stored juice. 184f. : Hosea 4:11 shown consistent with this. Up to 209 the word is discussed—very helpful. 209ff. : shekar = drink deeply. 232ff. : Deut 14:20 + shekar/strong drink. Up to 240. 257-8: Teachout thinks Nehemiah gave alcoholic wine to the pagan king—but this is false. Nehemiah neither drank alcoholic wine nor unclean meats, etc. Nehemiah 2:1 refers to grape juice. 270: Excellent point contra “moderate” wine—Scripture gives no hint on what point one goes from full control to beginning drunkenness/God’s wrath! Also 333. 317: Classical scholars recognized a long time ago that oinos/vinum could be unfermented; and so could the English word wine be so! 324: OT never even suggests that wine is better when mixed with water. 325: One drink or less has devastating effects! 332: Wine is controlled spoiling of grape juice. 363: Tirosh consistently translated by oinos. 367: LXX recognizes yayin can be fresh grape juice. 368ff. : oinos in classical, etc. Greek and payri as fresh grape juice. 370ff. : Instances where the Latin vinum is unfermented. 396ff. : How ancients kept grape juice unfermented all year. 435ff. : Proof that even one drink is bad for the health and hurts the mind. 442ff. : 1 Timothy 3, “not given to wine” and “much wine” for the bishop and deacon evaluated. Wine in the Bible: A Biblical Study on the Use of Alcoholic Beverages, by Samuele Bacchiocchi. Berrien Springs, MI: Biblical Perspectives, 2001. 263 pgs. Read 12/24/09. Bacchiocchi is a Seventh Day Adventist, and the first page of his book advertises other books he has written that are filled with heresy. He taught at Andrews University, the SDA school, and he died in 2009. Some of his quotations are questionable, such as the following, from pg. 178, concerning the patristic Jerome commenting on Ephesians 5:18—he appears to take Jerome quite out of context. This apparent contradiction can be resolved by recognizing that me paroinos does not necessarily imply moderation. In his word-by-word exposition of 1 Timothy 3:2, Jerome interprets me paroinos as totally abstinent. He writes: “‘not a drunkard’ (non vinolentum), for he who is constantly in the Holy of Holies and offers sacrifices, will not drink wine or strong drink, since wine is debauchery [luxuria —Eph 5:18].”84 For Jerome, me paroinos meant that like the priests in the Old Testament, the bishop must be totally abstinent. “[N]ot a drunkard,” for he who is constantly in the Holy of Holies and offers sacrifices, will not drink wine and strong drink, since wine is a luxury. If a bishop drink at all, let it be in such a way that no one will know whether he has drunk or not. Note that the very sentence after the one quoted by Bacchiocchi appears to directly contradict his conclusion. Bacchiocchi also has an entire chapter in his book on Wine and Ellen White—useless space for someone not in the SDA cult. SDA bias/theology also appears on, e. g., pgs. 11, 13-14, 15, 24, 29, 43, 48, 50, 57, 179-180, 216, 248; Ellen White is cited as evidence on pgs. 118, 139, 141, 241; etc. ; note also 175, 216, 225-247. On page 175 he makes the heretical and false assertion that in Luke 23:43 the location of the comma, indicating that the question of whether Christ promised the thief would be in Paradise that day, or that Christ was simply stating what He said that day, is simply a matter of translation preference, a totally false assertion, since the Greek syntax requires a pause after “you” and before “today.” Bacchiocchi also uses corrupt modern Bible versions. He has typos on pgs. 12, 13, 20 (2x), 22, 99, 123, 192, 194 (2x) 200, 204, 205, 206 (2x), 207 (2x), 210, 214, and 249. When talking about how to help alcoholics, he does not state that they need to be born again by repentant faith in Christ, turning from works to be justified by faith alone, because he believes in salvation by works, as a good SDA. The works of Bacchiocchi on other topics than this one certainly cannot be recommended, nor can he nor his denomination be called Christian—they are a cult which is abominable to the Triune God. It is also worth mentioning that his book contains an endorsement by the fundamental Baptist scholar Dr. Robert Teachout, author of the classic The Use of “Wine” In The Old Testament. However, Dr. Teachout has told me personally that when he reviewed the book it did not have the chapter on Ellen White and alcohol—so the especially blatent SDAism in the book was much less prominent than it is in the currently published version. Apart from these very substantial problems, the book has some good content and arguments demonstrating that the Bible requires total abstinance from alcohol. He takes the classical fundamental Baptist two-wine view, and does a good job attacking the one-wine view. Also, the book can be downloaded for free from the Internet, a definite benefit, as long as one is thoroughly indoctrinated against the heresies of the SDA cult. Sometimes he could argue more strongly than he does—for example, he says that Ephesians 5:18 only has “wine” as the referent for “excess/riot” as a possibility, but, as I have demonstrated in my analysis of Ephesians 5:18, the verse requires and proves that wine itself is excess/riot, and clearly forbids all consumption of alcohol. With the very serious cautions mentioned above, the book may be cautiously recommended as an acceptable resource presenting the true view on the Bible and wine to those who are not going to get sucked into the SDA cult. What's Been Happening with Kirk? Almost everywhere we go and to everyone who we talk to, who knows us, asks us how it's going with Kirk, my son. I always appreciate people asking, and I'm appreciative if they pray for him. He's doing well. He is a member of Liberty Baptist Church in Fishkill, NY, Pastor Paul Morrison, and he serves there in whatever capacity he can. Pastor Morrison says he is doing (Kirk is fifth from the left above) well, beginning to do some song leading and working in a nursing home service they have in the area. He has played piano when needed with hymn singing. Kirk has had several evangelistic conversations with various cadets. Kirk is in his second year at the United States Military Academy at West Point. The second year is the Yearling Year there. 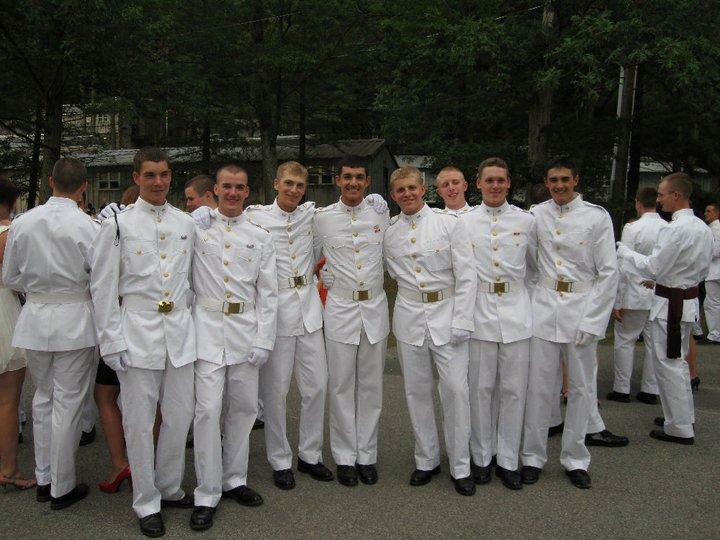 The yearling performs all year as a team leader in charge of a plebe, one of the first year cadets. Each cadet must join an athletic team. This semester Kirk is training with his company's Sandhurst team for the annual Sandhurst Competition at West Point on April 16. Every cadet learns languages and Kirk is taking French, common in African countries. As a part of French immersion, he will travel to Mali during Spring break for advanced individual academic development (AIAD). His first two years have been a rugged academic schedule in addition to other duties, including Physics, Calculus, and Chemistry, among others. Every cadet must learn the IOC (Indoor Obstacle Course) and take boxing. Many different national and world leaders visit the campus and give speeches, most recently just a few days ago, Kirk listened to a speech by Secretary of Defense Robert M. Gates. Much about West Point is unique, but the summer training is part of it. 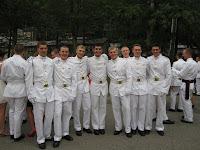 The summer before the plebe year, each cadet endures CDT (Cadet Basic Training), also called Beast. His second summer requires CFT (Cadet Field Training) at Camp Buckner. The third summer varies. Kirk will have at least two training sessions this year. In late May and then June he'll participate in CTLT (Cadet Troop Leader Training), which is leadership experience in active Army units. Then in June and July, Kirk will travel to Sandhurst, England for a month to train with the Royal Military Academy.